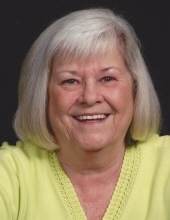 Verna Mae Wilkos, age 75, of Byesville, Ohio, died Thursday, March 21, 2019, at her home. She was born December 31, 1943, in Coal Run, daughter of the late George C. and Mary Geraldine Williams Fulton. She retired from March Electric in 1993 following 24 years of service. Verna was a dedicated Christian. She was a member of Faith Baptist Church in Belle Valley and its Women’s Ministry and Widows Group, and she was also a member of the United Methodist Women in Derwent. She was a former board member and president of Rocky Fort Resorts for many years, and she was part of a group that she enjoyed playing games with on the game site Pogo for over 20 years. Verna enjoyed crocheting, playing cards, and camping. She was the devoted matriarch of her family, and she was proud of her grandchildren and great-grandchildren. In addition to her parents, she is preceded in death by her husband, George J. “Sonny” Wilkos, whom she married in June, 1968, and who died April 30, 1993; her twin brother, William K. Fulton; and one sister, Alberta Jean Ross. Surviving are her children, Annette (Kennan) Ward of Columbus, Rick (Kathy) Haught of Senecaville, Tammy (Ed) Leasure of Cambridge, and Cherish (Jerry) Ditch of Caldwell; her step-children, Teresa (Steve) Moore of Caldwell, John (Tina) Wilkos of Athens, and Bryan Wilkos (Donna Johnson) of Caldwell; 16 grandchildren; 21 great-grandchildren; several nieces and nephews; and many wonderful neighbors and friends. Friends may call Monday, March 25, 2019, from 2-8PM at Faith Baptist Church in Belle Valley, where the funeral service will be observed Tuesday, March 26th at 11AM with Pastor Larry Copley officiating. Burial will follow at Hoskinsville Cemetery. Memorial contributions may be made to Genesis Hospice and Palliative Care at www.genesishcs.org or to 713 Forest Avenue, Zanesville, Ohio, 43701, or to the Faith Baptist Church Building Fund, 200 Grove Road, Belle Valley, Ohio, 43717. To plant a tree in memory of Verna Mae Wilkos, please visit our Tribute Store. "Email Address" would like to share the life celebration of Verna Mae Wilkos. Click on the "link" to go to share a favorite memory or leave a condolence message for the family.